This is the second part of a two-part series. In part one, we looked at consistency trends of quarterbacks throughout the NFL. Here we are going to examine in greater detail the consistency and production of the four NFC North quarterbacks. The previous installment featured a study of all 24 NFL quarterbacks who have started at least twenty games for the same team between 2011 and 2012. Conveniently, Jay Cutler, Christian Ponder, Aaron Rodgers, and Matthew Stafford—all four quarterbacks in the NFC North—fit that description. So let’s look a little closer at those four in an effort to better understand just how they compare to each other in terms of consistency and overall production. The overall numbers showed that Aaron Rodgers was far and away the most consistent of the four quarterbacks; his passer rating standard deviation of 20.5 marked him as the third most consistent in the NFL. Matthew Stafford came in at 23.5, slightly more consistent than average, while Christian Ponder was on the other side of average with a standard deviation of 27.2. 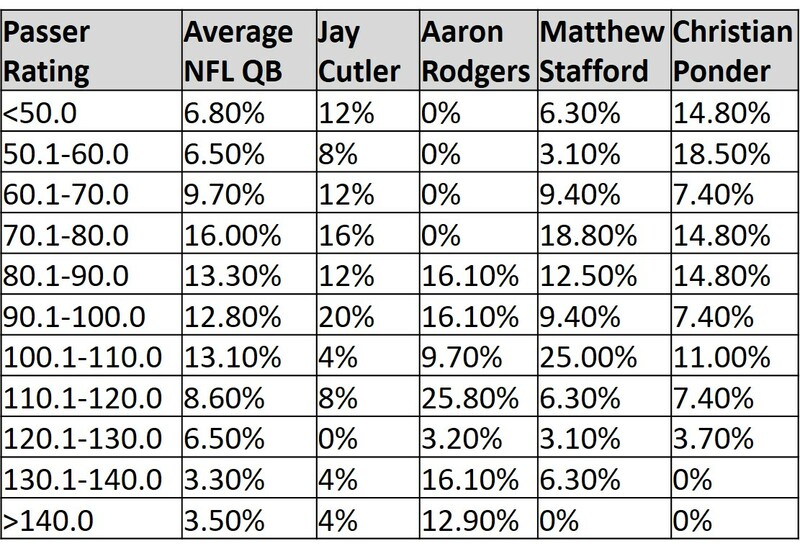 With a standard deviation of 30.0, Jay Cutler came in as the least consistent quarterback in the entire league. Let’s dig in a little deeper to see more clearly the distribution of their games relative to their average passer rating that season. The chart below compares the percentage of games that are within 10.0 points of their average, between 10.1 and 20.0 points of their average, between 20.1 and 30.0 points of their average, and more than 30.0 points away from their average. The table also lists the percentage of games in which the quarterback is more than 50 points away from his average, but it should be noted that this is a subset of the 30 point group and those two are therefore not exclusive of each other. There are a few interesting trends to note here. First, observe that Rodgers, the most consistent quarterback, has a significantly lower percentage of game right at his average than either Stafford or Ponder. What makes Rodgers so consistent is that he avoids the extremely varying games that are more than 30 points from his average passer rating. All of his games basically fall within a range of 60 points (i.e., ± 30 from his average). That is not the case for the other quarterbacks, particularly Cutler and Ponder; nearly one-third of their games fall more than 30 points from their average passer rating. A large reason why Cutler has the largest standard deviation an insanely high proportion of his games — 16.0% — fall more than 50 points from his average. This is more than four times the NFL average and nearly doubles that of any other quarterback. It is important to note that all of the statistics discussed to this point have been about quarterback’s average and their production relative to that average. This ignores the difference between the average production of the quarterbacks, which can be fairly substantial when you consider that Aaron Rodger’s average passer rating of 114.9 is nearly 30 points better than that of Matthew Stafford, the second-best quarterback in the division with an 88.1 passer rating. So let’s put some clarity in this discussion by looking at real numbers instead of simply averages. The table below shows the percentage of games that have fallen in various passer ratings by the average NFL quarterback (the 24 in the overall study) and each of the four NFC North quarterbacks. 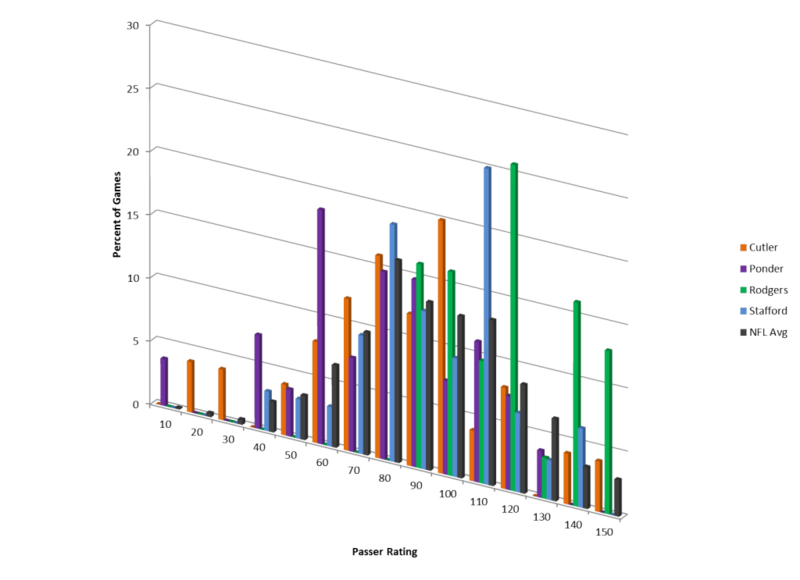 The graph below that shows the same numbers in a visual format. These numbers show three clear groupings in the NFC North quarterbacks. Ponder produces an abnormally high number of bad games without really having many really good ones (only one game with a passer rating above 120), making him a below-average NFL quarterback. To be fair, Ponder has only finished his second year, so he still has significant room to grow. Stafford and Cutler both have roughly average numbers, at least in terms of their most typical passer ratings, although Cutler does have an atypically high number of really bad games. The true standout here is Aaron Rodgers, as he incredibly has no games with a passer rating below 75 in the last two years (in fact he has none below 80); he is the only quarterback in this study who can claim that remarkable feat. The typical Rodgers game resides in the very good category, with relatively equal numbers of average and great games. This clearly illustrates the difference between Rodgers and the rest of the NFC North quarterbacks. A bad game for Rodgers, when his passer rating is in the eighties, is an average game for Cutler, Ponder, or Stafford. An average game for Rodgers is a very good or great one for one of the other three. This is not an earth-shattering revelation. Rodgers is clearly the best quarterback in the NFC North and by most statistical measurements is also the best quarterback in the NFL. It is truly remarkable, however, to look at just how large the gap is between Rodgers and the rest of the quarterbacks in the division. This is the part for all you lazy bums who don’t feel like doing much reading (that’s all of you, including me). I’m going to put my findings in simple, easy-to-digest bullet points so you can skip all the long, confusing words above! Aaron Rodgers is one of the most consistent quarterbacks in the NFL because he is exceptional at avoiding games with extreme passer ratings (relative to his average). Jay Cutler is the least consistent quarterback in the NFL because he has an incredibly high rate of games that are either really good or really bad. A bad game for Aaron Rodgers is an average game for any other NFC North quarterbacks.